Journalist and author is the latest David Letterman Distinguished Lecture Series participant at Ball State. In the wake of the mass shooting at Umpqua Community College in Roseburg, Ore., many were compelled to revisit footage of Sen. Robert Kennedy speaking in that very community in 1968 about the issues of mental illness and gun control. 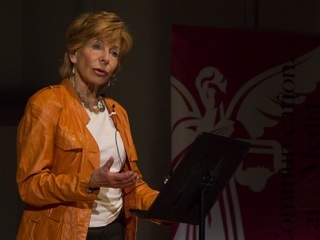 The politician’s swing through Oregon, which occurred just a few weeks before he was assassinated, also figured in the early career of journalist and author Gail Sheehy, who spoke Oct. 22 to students at Indiana’s Ball State as part of the school’s David Letterman Distinguished Professional Workshop and Lecture Series. A year later, Felker approached Sheehy about covering Bobby Kennedy’s presidential campaign. “The way to make your name as a journalist is not to write a lot of little stories, no matter how good they are. No one’s going to remember… You have to grab onto a big story, something everyone’s talking about but they don’t know why,” he told her. Sheehy went with Kennedy to Oregon as he visited several small communities and campaigned for limits on guns. In the Daily News report, the New York Herald Tribune is wrongly spelled as the Harold Tribune. A Freudian slip by writer Amanda Belcher, worthy of a time when men ruled the journalism roost. On the heels of Sheehy’s 2014 authobiography Daring, the journalist, now 77, has launched something called the Daring Project. Read more about that here.